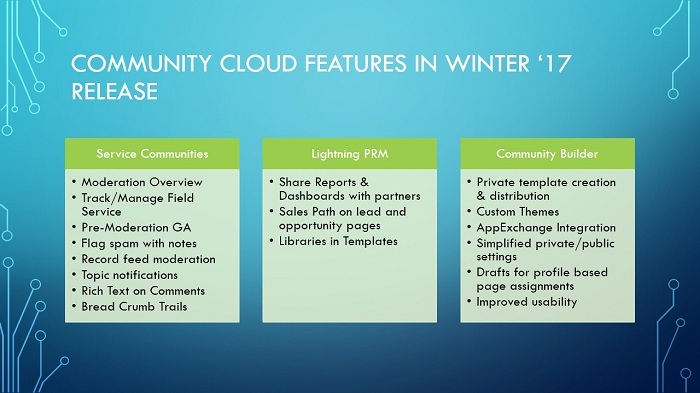 The 51stSalesforce Release brings many platform improvements and enhancements. We will talk about Community Cloud and its new exiting features. Pre-moderation: a moderator can review posts and comments before they get published. Moderator can mass review and approve comments. Moderation Overview page shows moderation activity and pending tasks. Members can flag content as inappropriate or spam and leave a note to the moderator who can block the spammer. Administrator can moderate posts and comments on objects. Users can subscribe to topics via Notification Banner or Follow Button. This is for the first time comments support the same Rich Text Editor as posts. The component available in community builder. It displays a horizontal navigational path. Provide faster and smarter on-site services with Field Service. Add work order and work line items, products and assets via Page Manager. Share Reports and Dashboards with your partners on the separate community page. It is possible to show reports and dashboards from Salesforce org on Template-based Community Pages. Add Sales Path to Lead and Opportunity Pages to guide your partners through the sales process of your company. Libraries in Templates a single location for all your branded resources. Now it is possible to export a community template from a developer’s org and use it to create a new community in a customer’s org. Apply a custom theme to a community to complete the look and feel of the brand. All your components and data retained. Download AppExchange components directly from the Community Builder. It is simple to make a community or any page in a community public or private. More editing space, inline editing, and rich content functionality in the Community Builder. Enhancements to Video Upload in the Rich Content editor – preview and see the video inside the builder.